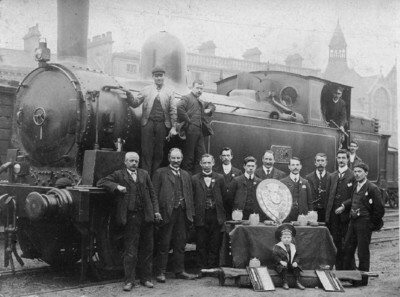 An ambulance team pose with their trophies in front of no. 596. Maybe the buildings in the background will give a clue to the location. Naturally my first thought was Shrewsbury. But looking at Rail Centre no. 10, Shrewsbury by Richard Morriss, it is definitely not. But surely someone will recognise that rather nice ornate building behind the Coal Tank. I await the suggestions with interest! I can't help with the location but Coal Tank no. 596 (LMS no. 7794, BR no. 58925) received its carriage heating equipment in 1901 and, because it has the centre headlamp bracket, must date the photograph to between 1901 and 1903. Could it be Cardiff, Tyndall Street goods yard? I think Harry Jack may well be right. The tower over the cab could well be that of St.Pauls Catholic church in Tyndall Street although the only picture I can find to compare it with is very small and has needed much fiddling to pick out the detail. I am sorry to disagree with Pete Skellon, but the picture appears to show both a centre lamp socket and carriage heat relief valve on the cab roof. From the dates Pete gives it must then be after 1903. I've just noticed that the engine also has only one whistle, so must be after 1903. The van to the right of the engine looks like a standard LNWR roof door van and as one can't see the lettering it probably has diamonds only. LNWR lettering was introduced in 1908, so the photo was perhaps taken not many years after that, at the latest. More interesting is the van to the left. It looks like another LNWR roof door van, but unless my eyesight is worse than I thought, it has gaps between the planks. If so, then it is a beer van. Not a common vehicle at all and normally associated with Burton-on-Trent. Was there some sort of trade between Cardiff docks and the brewing industry? Mike Williams comment about Burton-on-Trent reminds me that there was regular beer traffic from Burton to South Wales via Wichnor, Lichfield, Stafford, Shrewsbury and the Central Wales line. In the 1960s, it was transferred to the Midland route and the Stafford-Shrewsbury line was closed (last passenger trains in 1964).